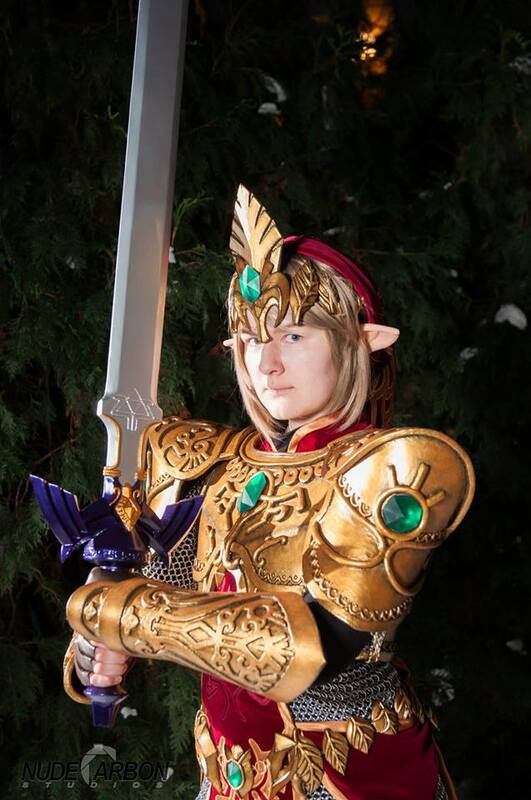 Rinkujutsu gave us this writeup regarding how she used Flexbond to create a smooth finish for their Magic Armor from Legend of Zelda. I’ve been asked a few times about how I smoothed out my Magic Armor Link Worbla armor before painting, so I decided it’s about time I did a mini tutorial on it! Be prepared for a long text post! After trying numerous techniques for smoothing Worbla, I settled on Flexbond as my favorite. 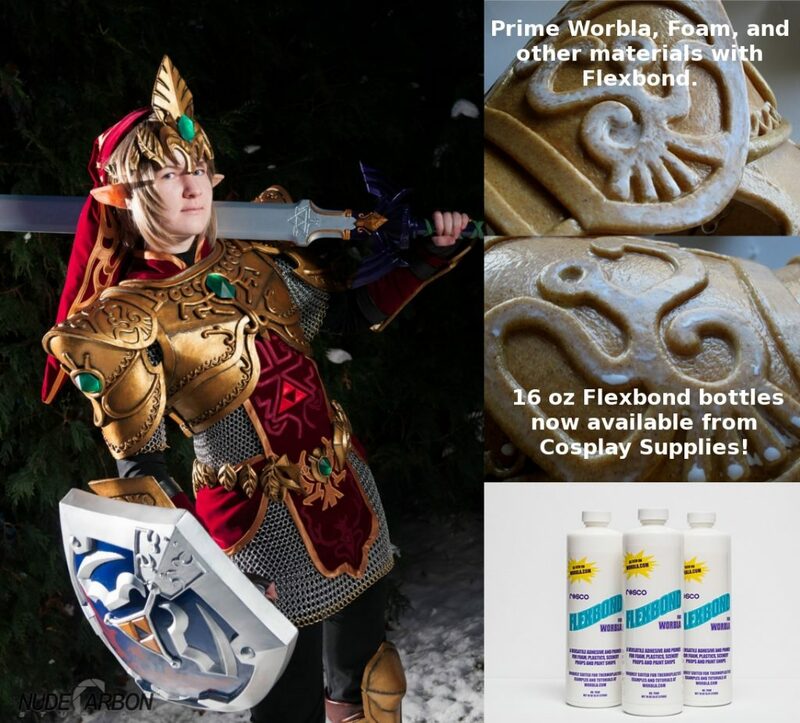 I first heard about Flexbond from a smoothing guide on Worbla’s website:. Also, here is another guide specifically about Flexbond. Why is Flexbond my favorite smoothing product? It 100% flexible. You can do anything to it and it won’t show damage. I can fold a piece of armor in half without it showing any signs of cracking, wrinkling, or pulling away from the Worbla surface. Basically, you’ll destroy your armor before destroying the Flexbond surface. Flexbond is also non-toxic and creates very smooth surface. I’ve used Flexbond on EVA foam, Worbla, Black Worbla, and Thibra, and it works wonders on all of them. You can order Flexbond in 16 oz or gallon sized bottles from Cosplay Supplies here. I discovered that brushstrokes show after a few coats (as you can see in the top left photo above), so I added an extra technique to getting it smooth. I was inspired by Nefeni Cosplay’s guide on buffing wood glue primed Worbla with wet sandpaper. I figured it would work on Flexbond as well. To start with, I coated the armor with four coats of Flexbond. Four coats is plenty and I have never needed more. After that, I took a piece of 320 or 400 grit sandpaper and dipped it in water so that it was slightly wet. Using the sandpaper, I buffed the armor surface in a circular motion. The surface turns back into glue (as you can see in the top middle photo), but this isn’t a bad thing since you can use this to your advantage and smooth out the surface more quickly. If there are drip marks after it dries (bottom middle photo), you can go back and re-buff it as many times as you like! This worked best on flatter areas with less detail. On hard to reach areas and the raised Worbla log details, I used my finger dipped in water and smoothed it out that way. Afterwards, you can paint your base coat and proceed to painting! For Black Worbla and other Thermoplastics that are smoother than regular Worbla, you only need to buff the surface with your finger and water to remove the brushstrokes. Wet sanding is only necessary for very rough surfaces. I hope this is helpful and if you have any questions feel free to ask!